Over the Christmas holidays all received QSL requests were processed. About 700 letters were handed over to the German post office for shipping. Over 2500 QSL cards were issued. 1500 QSL requests were answered. The letters should arrive in the next few days/ weeks. Our experience with overseas mail shows that the transport takes a little 2 to 3 weeks. The Bureau Cards will be send at the beginning of January to the DARC QSL Bureau. 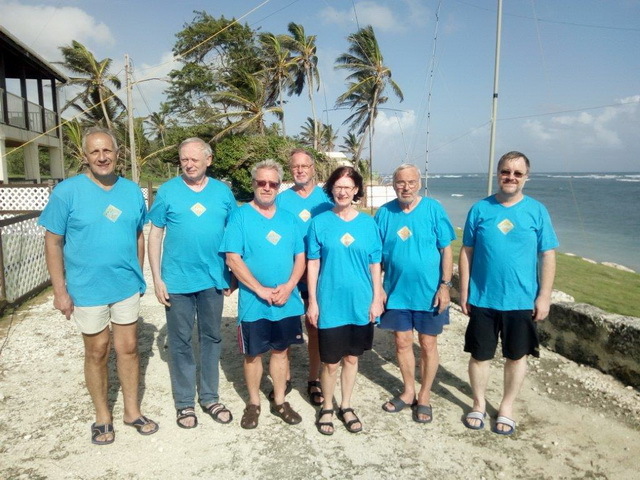 8P9AE went QRT today at 10:00 UTC with 37597 QSOs and is now history. 1. The 110 volt power supply network. 2. The persistent violent winds required permanent work on the antennas. 3. The high salty air challenged the technology significantly. Fans just died, a PA died of salt death, the 2nd amp requires a rebuild after basic cleaning, 4 power supplies from Eaton have died (because the salt broth has run out), the fan of one K2 died and all devices are covered with a thick salt crust. We had great pleasure in working through the pile-ups, albeit some equipment has to be replaced. Despite the adversity a respectable result has been achieved. 25,000 QSOs in the log. We had strong winds last night. As a result, the 160m vertical has fallen over, a VDA antenna has blown over it, even the 80m dipole has torn the wind. We eliminated the damage during the day. Now all antennas are working again. We have reached over 21,000 QSOs. Please do not send us mails to fix logging errors during the DXpedition. We don't do that now. 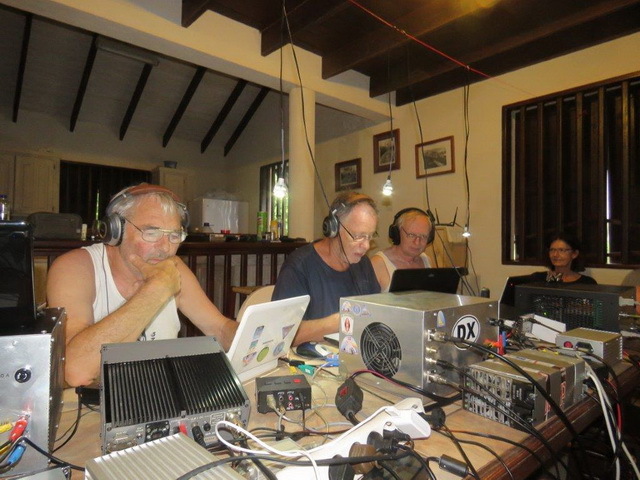 We will publish an e-mail address here when the DXpedition is over and take care of all errors in the log. Our location, the grid locator is GK03ge. Next set of pictures is uploaded. Yesterday we had a meeting with Ishmael Cadogan. He is the head of the radio club and at the same time responsible for the licensing. After the meeting it is now clear that we are allowed to operate on 60 m. So we will continue to build antennas. Yesterday was dominated by further antenna settings and optimizations. The locations have partially changed and an 80 m long dipole has been added. Now 80 and 160 m are possible at the same time. The 110V power supply is a big challenge, the OX1000 has no problem with it thanks to the Eaton APRS48-3G. In our opinion, the HVLA1K3 would need to be optimized for the 110 Volt application. With the IC73000, the USB interface has to be optimized. One station with the notebook runs without problems. The second one may not see any RF on the USB cable. That's why our keying had been strange at times. Everyone is fine and all the equipment runs well. First pictures uploaded. Everything runs well here. The VDA antennas play well. The SpiderBeam was too short everywhere. But we fixed that. The 1.5 kW bandpass filters also work great, three stations in parallel are no problem. However, the HVLA1K3 amp had one problem with the 110 V. We fixed that, too, and this amp is running also. The first night on 80m was great, we made over 450 QSOs. Next night 160m. Everything is organized. The equipment and the antennas are packed. On Tuesday morning we fly from Berlin Tegel via Frankfurt to Bridgetown. Today we received the license certificates. Thank you for support to the members of the ARSB. The licenses are applied, the accommodation is booked.